A very British thriller set in the heart of the Lake District. 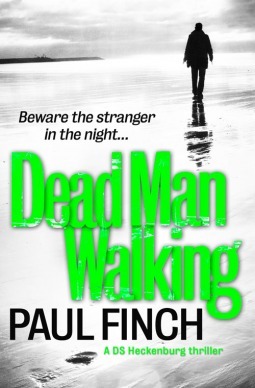 Reprising his DS Heckenburg character, Finch has crafted a tense and pacey tale which draws on a previous case from 2004 in which Heckenburg’s former girlfriend Gemma Piper, now head of the Serial Crime Unit, but then a lowly PC acting as decoy, ensnares and shoots a sexual sadist known only as the ‘Stranger’. Although apparently fatally injured the Stanger escapes arrest and disappears leaving a question mark over his identity and fate. Jump ten years to present day Cumbria; Heckenburg and his current partner Mary-Ellen O’Rourke are investigating the disappearance of two female hikers who, owing to several coincidences in the Modus operandi, may have been attacked by the reactivated ‘Stranger’. On the auspices of following up the original ‘Stanger’ murders, Huckenburg contacts Piper in an attempt to bring her back into his life, despite his current romantic entanglement with local pub landlady Hazel. The Fog swathed remoteness of the Lake District village on which the story centres is ideal for creating an atmosphere of isolation and of being trapped without outside help. As the murders begin to mount, and grow increasingly brutal, emotions begin to run high as the villagers and police alike begin to feel increasingly confined seeking shelter in the local pub. Heckenburg begins to question his initial assessment of the murders as it becomes apparent the ‘Stranger’ has switched MO from serial killer to spree killer and the coincidence of Heckenburg being based at the same location as the ‘Stranger’ becomes too significant to ignore. When it finally becomes apparent that the killer is among them in the safe surroundings of the local pub, Heckenburg devises a plan which will either expose the murderer and save them, or lead them all to a savage death. Finch pays great detail to his writing particularly the location in which it is set, so much so that he frequently refers the local roads by their actual name (for example the B5343), and the weather (although to be fair the fog plays a significant part in the storyline) and it’s these two aspects which give the book such a British flavour. Being an ex-copper himself Finch writes with obviously sympathy for the police officers and rather less sympathy for the locals, although in comparison to the great detail with which he describes the landscape and the set piece elements of the story, the characters are not as well developed and subsequently not as easy to identify with. There is a twist which for obvious reasons I won’t divulge, but it wasn’t too difficult to work it out way before the ending.